Sino sa tatlong larawan ang favorite niyong anime? ABS-CBN Animation official FB page is still absent for a very long time! Hindi rin nila pino-promote ang Naruto Shippuden Season 8 sa page. Kelan kaya sila muling magpo-post araw-araw? 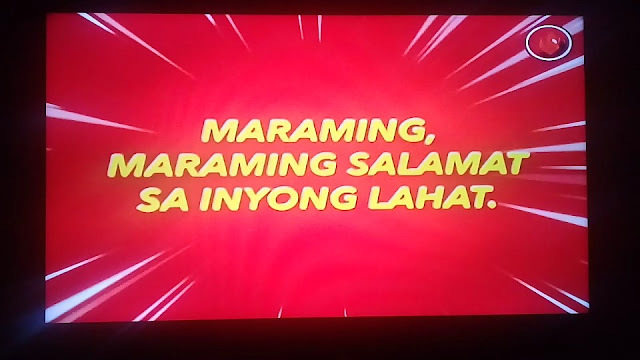 Nais po naming magpaumanhin sa hindi pag-ere ng Doraemon nung March 12, 2016. 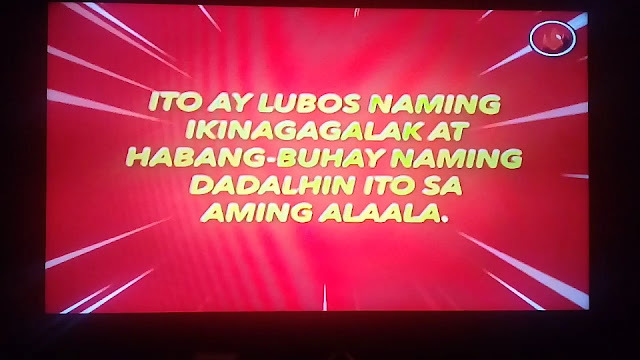 Madami sa ating Kapamilya ang nag-antay para mapanood si Doraemon at kami po ay humihingi ng tawad sa kadahilanang may mga hindi inaasahang pangyayari. Sana'y maunawa ninyo at ipagpatuloy ang pagnood ng Kiddie Blockbuster tuwing Sunday! 10:30am! This is the last post of their only official FB page. 4 months na silang inactive ngayon at never nilang pino-promote ang Season 8 ng Naruto Shippuden. This is another tragedy for ABS-CBN Animation unit. Dear Management, how many times do we have to say na TANGGALIN NYO NA ANG KAPAMILYA BLOCKBUSTERS!!! 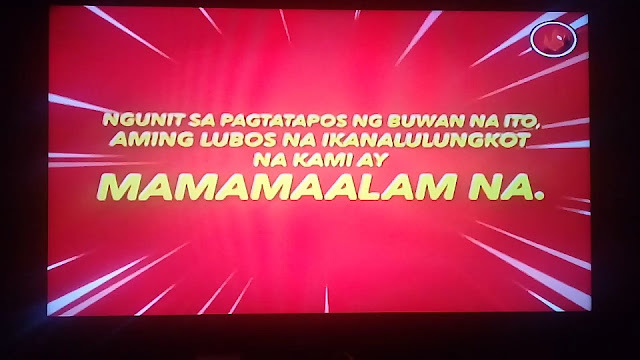 Ano pa ba ang silbi ng araw-araw na Free Movies sa TV mula umaga hanggang gabi kung meron naman dyang CineMo, Cinema One, HBO, Star Movies, at marami pang Movie Channels. Please, enough of that Umaganda's morning monkey ratings business dedicated for many people who dislikes Animated shows. 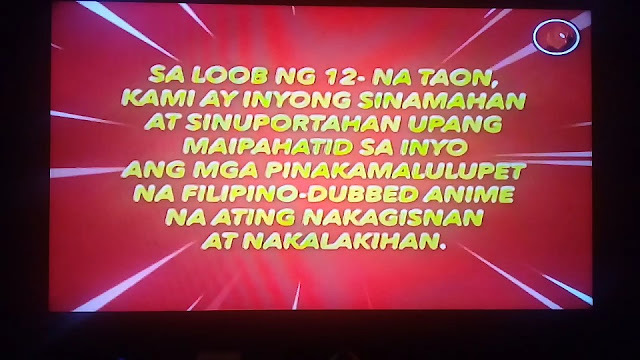 Very Unfair para sa maraming Pinoy Otakus na mahilig manood ng mga Tagalized Japanese Animes sa TV na umaasa at naghihintay para lang sa wala! Ito ang itsura ng characters sa Kuroko's Basketball kapag naging Live action sila. Sino sa kanila ang hawig sa anime? Actually, this is the poster for the Stage Play. Alam nyo ba kung ilang Animes na ba ang pinalabas sa Team Animazing ngayong 2016? 1 lang, right, tanging Naruto Shippuden Season 8 lang ang pinalabas ngayong taon. As usual, tulog, patay at walang updates ang ABS-CBN Animation official FB page, and I heard wala man lang ni isa silang nakuhang mga bagong Japanese Animes para sa Dos. Mukhang hindi na nga talaga matutuloy ang Kuroko's Basketball Season 3 sa Dos ngayong taon, and it's unconfirmed kung Next Year pa ba ipapalabas sa Dos or Shelved na talaga para ilagay sa YeY!. Hindi na rin ako magtataka kung baka ang Season 9 ng Naruto Shippuden tuluyan na ring hindi ipapalabas sa Channel 2 next year. Wala man lang teaser para sa mga bagong Japanese Animes ng ABS-CBN noong Trade Launch. What a big shame. It’s the end of an era. Sources familiar with the matter has told Anime Pilipinas that Filipino language anime channel HEROtv is set to have their final broadcast on Wednesday, January 31st, after 12 years of broadcast. The Filipino-dubbed movie channel TAG, which was broadcasting for just over a year, is also shutting down at the end of this month. ABS-CBN, the parent company of the two channels, decided to close them down due to lack of advertiser support. Anime Pilipinas has tried to contact the representatives of HEROtv and ABS-CBN for comment, but no response as of press time. HEROtv is a Filipino language anime channel of media conglomerate ABS-CBN, under its ABS-CBN Cable Channels subsidiary, which started its test broadcast in August 2005 and was officially launched on November 12, 2015. The channel initially offered anime shows from Telesuccess Productions plus their own acquisitions, including Voltes V, Shaman King, Naruto, Mirumo de Pon!, Zenki, Ragnarok the Animation, and Mobile Suit Gundam SEED among others. Eventually, the channel landed other landmark titles such as Yakitate! Japan, Major, Death Note, Log Horizon, The Devil is a Part-Timer, Fate/Zero, Haikyuu! !, Yowamushi Pedal, Free: Iwatobi Swim Club, Food Wars: Shokugeki no Soma and Love Live! School idol project. This year, notable titles they have aired include Beautiful Bones: Sakurako’s Investigation, KonoSuba, The Asterisk War, Tanaka-kun is Always Listless, Love Live! The School Idol Movie, Love Live! Sunshine! !, and AnoHana: The Flower We Saw That Day. HEROtv also organized events that became fixtures on the Japanese pop-culture scene in the country, like “Hataw Hanep Hero” in 2005-2007, then “HERO Face Off: The Ultimate Cosplay Battle” in 2010-2015. IMO. I'm sure all the bashers, detractors and haters are happy and celebrating right now since all the Advertisers and the Management are very successful in fully prioritizing those boring Koreanovelas. Seriously, MALAKING KAWALAN ang Hero TV, promise, and I considered this bad news as ABS-CBN's Saddest and Worst Christmas & New Year's Gift to all the Japanese Anime viewers and fans. After the "permanent deaths" of TEAM ANIMAZING Morning Block (sa Dos) and HERO TV (sa Cable) well I wouldn't be surprised if YEY! Channel (sa TV Plus) will be shutting down too (in the next decade or far future) since ABS will focus too much on KDramas/Asianovelas. Due to a change in business direction, Creative Programs, Inc. will cease airing of the following channels on the specified dates below. For shows on new sights, sounds and scenes, watch TLC ch 62. You may still catch exciting Anime action on Animax, available on Select. Click here to subscribe. Why can’t I watch these channels anymore? Due to a change in business direction, Creative Programs, Inc. will cease the broadcast of these channels. Thank you for your understanding. Will there be replacements for these channels in my basic or pack channel line-up? Please be assured that we are engaging more channel partners to add more compelling content on our platform to give our subscribers the best TV-viewing experience. Philippine cable provider Sky Cable confirmed with ANN that Philippine anime television channel HERO TV will cease broadcast on January 31. Sister channel TAG will also cease broadcast. As of press time, HERO TV and TAG have not responded to requests for comment by ANN. Recently in December, the channel aired the anohana anime, and aired other recent anime in 2017. Media conglomerate ABS-CBN launched HERO TV in 2005. The channel airs Filipino-dubbed anime. The channel initially re-aired classic anime with Filipino dubs that ABS-CBN had already licensed, such as Voltes V, Naruto, Shaman King, and others. It then moved to licensing anime on its own, and in the past years, has been airing Filipino dubs of anime that aired only three or four seasons previous. ABS-CBN launched TAG in October 2016. The channel airs Filipino-dubbed Hollywood and Asian films, including anime films and adaptations of manga. The channel had previously revealed that it will air the your name. and A Silent Voice anime films, but they have not yet aired in the channel. Although you can see posts of Animax in this blog it is with great pride that I would tell all of you that in my heart I love both of them. Animax provides Anime shows in its Japanese sub format while Hero TV provides a version which is closer to our hearts - Tagalized anime. It brought anime closer to everyone specially the masses. I would say IF NOT FOR HERO TV ANIME AND COSPLAY WILL NOT BE LIKE WHAT IT IS TODAY. January 2018 will be remembered as a sad month for anime. I never thought that I would see Hero TV suddenly end its broadcast like this. This channel is the only channel which gives the chance to Filipino dubbers/voice actors. Many Filipinos with the help of the likes of Voice Master Pocholo Gonzales realized their long time dream of voicing the character of their beloved anime. If not for Hero TV we could not have understand more what each anime felt like as if they were one of us - Filipinos. Is this really the end of Hero TV and Tagalized Anime? We would like to think that it is not. ABS-CBN is probably streamlining its channel. If you do not know yet there is a channel called Yey! This channel is the digital TV counterpart of Hero TV. Yey! also airs Japanese anime series and in addition also airs foreign cartoon shows most of them are Tagalized or Filipino-duubed. Will this only be a moved to removed redundant channel and eventually make anime more available to everyone through the ABS-CBN TV Plus? So is it the end of Filipino-dubbed anime and Hero TV? The answer maybe NO because there is still Yey! Hero TV is being laid to rest perhaps due to the redundancy of channels but between Yey! and Hero TV, I would choose the latter because BIDA KA RITO. I would like to personally thank Hero TV for all the support that they had given to our event. Even though our events are just small and not as big they are very willing to support it and even give airtime on their channel. The interviews I had with Hero TV will be treasured forever. I will miss you Hero TV! Arigatou! Sayonara! I considered this as ABS-CBN's Worst Management Decision ever for permanently shutting down the first Filipino-dubbed Anime channel, because all this time mas nakikinig sila sa mga witty and mean criticism ng mga bashers at haters. Business, social media detractors, advertising, and more. Iisa lang naman ang Puno't Dulo ng Lahat kung bakit mawawala na ang mga Tagalized Animes dito sa Pinas in the future: kasalanan lahat ng Koreanovelas at mga Tagalized KDramas.